• So very refined. • The most car-like cabin we've seen to date. • V6 powertrain is silky smooth. • Ever so expensive. • Some evidence of Nissan parts sharing. • Could be made plusher. We dare you to walk into any BMW dealership today and refer to any one of their high-riding family cars as ‘sports utility vehicles.’ Their eyes will turn red and steam will bellow from their ears as they correct you from ever referring to their cars as ‘utilitarian.’ Instead, they insist, their X cars are ‘sports activity vehicles,’ with that term possessing enough distance from the term ‘utility’ to not risk diluting their luxury appeal. Mercedes-Benz, however, doesn’t care that much about some of its cars from being called utilitarian. Perhaps the difference here is that Mercedes has, for the last four decades, made military cars in the form of the G-Class, not to mention its enormous commercial vehicles division, and that most certainly hasn’t posed any threat to its luxury positioning. The confidence that Mercedes-Benz enjoys is likely why they’ve delved into a brand-new segment with their new X-Class ute, throwing caution to the wind and keeping success in focus. Buyers looking for tax-friendly, multi-purpose vehicles are growing, and the X-Class is built with them in mind. With most significant markets around the world employing a tax strategy that’s rather lenient on utes, it makes sense that Mercedes-Benz wants a contender in the segment, promising to offer the refinement and luxury expected of the marque, alongside the rugged dependability and versatile ability that every ute has to have out of the box. Available as an X220d, X250d, and as a V6 X350d, the Mercedes-Benz X-Class promises to be the Mercedes-Benz of utes. Had it come to market a decade or so ago it might have set new benchmarks, but in the highly-competitive and increasingly-sophisticated modern ute market, can the X-Class steal sales from highly-regarded competitors like the Volkswagen Amarok V6, Ford Ranger, and Toyota Hilux? If you think the X-Class, minus all the look-at-me bits like its flashy LED headlights and diamond-polished alloys, looks a bit familiar, there’s reason for it. Rather than spend billions of dollars and far too much time developing a ute from the ground-up, Mercedes opted instead to go with one of the most road-friendly utes on the market, one with a unique multi-point link suspension setup in the rear, and use that as a base. That’s right: Underneath the sleek, European body, is a Nissan Navara. That’s no bad thing, however, The Navara is not only a trusted name in the ute market, but the current NP300 model is lauded for its tidy handling on-road (though not much else). Mercedes-Benz were delighted to work with the Navara as a base, as they felt that its accomplished ride and handling on tarmac would be an excellent base to build upon. 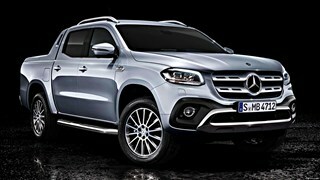 An extensive redesign brings a unique face crowned by (what else) the badge, along with distinctive headlights and a front bumper treatment that puts the X-Class firmly in line with the rest of the Mercedes-Benz lineup. Down the sides you’ll notice the X-Class’s Japanese lineage with a very familiar profile, but the rear again gets a unique design that looks rather spiffy, flanked by smart LED taillights. The X-Class, over the Navara, is some 70mm wider, giving it greater presence on the road as well as the ability to fit an Australian pallet between the rear wheel arches. Aside from that, the X-Class is available in Pure, Progressive, and Power trims, in ascending order, with the mid-range Progressive model offering the best of the utility-focused Pure and the incredibly-posh Power models its sandwiched between. Mercedes-Benz, in the engine and drivetrain department, has chosen to play it safe with its options. The German marque’s four-cylinder diesels, while good, can only be offered with all-wheel drive in the form of its permanent 4Matic system, which is complex, expensive, and rather thirsty. As such, the X220d and X250d variants utilise a 4-cylinder turbodiesel from Renault, paired to a seven-speed automatic gearbox, and features a powertrain selector that allows drivers to choose from rear-drive or all-wheel drive, depending on the situation. In X220d guise, the mill puts out 120kW and 403Nm, not inconsiderable numbers, particularly on the entry-level Pure model that’s lightest in the range. However, we reckon that a bulk of buyers will opt for the more powerful version of this oiler in the X250d, which puts out 140kW and 450Nm, thanks to the addition of a second turbocharger. The X250d is claimed to consume an average of 7.9L/100km on the combined testing cycle, and with a careful right foot, we have no reason to believe that real-world consumption will be too far off. However, those keen on unlocking the X-Class’ full breadth of ability would be best catered to by the X350d. This model comes with one of Mercedes-Benz’s own diesel units, a V6 turbo, which puts out 190kW and 550Nm, mated exclusively to a 7-speed automatic gearbox. The X350d comes fitted with Merc's own 4MATIC all-wheel drive system (rear biased, 60:40), rear differential lock, low-range gearbox, and a 600mm wading depth. Though arguably, the typical X-Class owner would shriek at water more than 20mm. If the exterior of the X-Class still feels a bit Navara to your eyes, stepping inside will go a long way in fixing that perception. Sure, there are still traces of Nissan here and there (like the key, most obviously), but on the whole, it’s a distinctly Mercedes experience inside. The dashboard feels like an amalgamation of the ones you’ll find in the C-Class saloon and V-Class van, while the switchgear mostly feel exactly as they should: Right out of the Merc parts bin. Some aspects are glaringly low-rent though: The rake adjustable steering wheel for example, as well as the gear selector and manual handbrake. We can’t recall the last time a Mercedes-Benz steering wheel wasn’t reach and rake adjustable, or when we last saw a manual handbrake in something from Munich. Anyway. In top-spec Power trim (like the kind photographed here), you get so much kit that it really feels like a Mercedes-Benz SUV. There’s an 8.4-inch infotainment screen (lesser models get smaller units) paired to a rotary-style controller, Artico leather upholstery, typically-Mercedes instrumentation, and rear air-conditioning vents. There’s masses of room inside, thanks to the widened track of the X-Class, though the raised rear seats (to offer greater forward visibility) hampers headroom slightly, but only for the very tallest passengers. The heavily-bolstered seats are comfortable, though the backrest in the rear is a tad upright, making long-journeys perhaps that little bit less comfortable than would be ideal. There’s little doubt that Mercedes-Benz did their best to make the X-Class handle like a true Merc, and in some way, they have. Unique front and rear axles, unique steering geometry, and a heavily-revised suspension mean that the X-Class has that same effortless ability to be captained through most situations, with motorway cruising and gentle back-road progress being where the X-Class is most comfortable. Noise, vibration and harshness levels are impressively low (for a ute), with the engine, tyres, and wind kept isolated from the cabin, even when speeds pick up. The unique suspension tuning means that the X-Class is also very confident at high speeds, something that most utes fail to be. But in some ways, they haven’t really been able to nail it. For starters, the X-Class can feel a tad more cumbersome in town than say a similarly-sized SUV, while the hydraulic steering is not only remote in feel, but requires far more turns than most to go from lock-to-lock. This isn’t a Volkswagen Amarok that’s for sure, and far from being a Ford Ranger. The former cars’ truly planted and effortless driving experience set it in a class of its own when it arrived, while the latter’s ability to get you giggling around back roads remains, so far, unchallenged. But back to the X-Class’ strong points. The suspension tune deals with lumps, bumps, and undulations with incredible ease, making light of potholes and unsealed surfaces. The seats are comfortable and rather supportive (up front, at least), meaning you won’t feel exhausted on arrival at your destination. “Among its rivals, the X-Class certainly has one of the better infotainment systems.” — WhatCar? Expected from any Mercedes-Benz is a healthy level of tech and kit, and the X-Class doesn’t break from the mould. The X-Class range features a full gamut of airbags, as well as things as lane-keep assist, collision prevention, and active braking (or AEB to you and I). Blind spot monitoring and intelligent cruise control is missing here however, though that won’t likely dent the X-Class’ appeal much. As we mentioned earlier, all cars get the COMAND infotainment system and its related rotary controller as standard, along with a driver information display between the dials, and digital radio. You can add on things like unvarnished wood grain trim, as well as leather for the dash-top and armrests for added plushness. In late February 2018, the X-Class was awarded a full five-star ANCAP safety rating, scoring highly for both adult and child occupant protection, and receiving commendation for offering autonomous emergency braking for the first time in the segment. AEB is available across all models. A Mercedes-Benz among utes, the X-Class most certainly is, but it struggles somewhat to truly come up on top. In a segment that’s becoming increasingly sophisticated, we can’t help but think that the ‘premium ute’ niche has already been filled by competitors who have clawed their way up from true utilitarian offerings to ones that offer luxury and ability in one go. Cars like the Toyota Hilux and Ford Ranger have done this rather successfully, with flagship models in both ranges getting so very close to an SUV-like experience, while the German newbie in the form of the Volkswagen Amarok burst onto the scene with all the maturity, sophistication, and sure-footedness expected by the VW badge. And the Merc is pretty much the same. There’s no doubt that the X-Class sits above those cars in terms of its refinement and overall presentation, though the issue we have with it is that its superiority isn’t quite as clear-cut as we’d hoped. The X-Class is very capable, rather good looking, and pretty slick as far as utes go, and we have no doubt that it’ll sell in very healthy numbers the world over. Credit where credit is due, the Mercedes X-Class is most definitely more refined and more comfortable than the Navara on which it’s based, and will carve its place in the world with more ease than the Amarok has. The wide range of options for the Merc will probably go some way in winning over more buyers too, with the most fortunate X-Class buyers able to spec their utes up to SUV-levels of kit. Ultimately, the X-Class is exactly what it says on the tin: A premium ute.